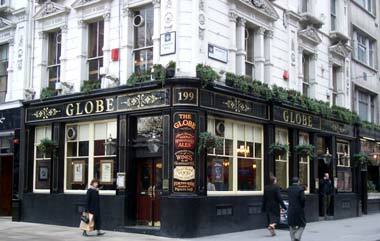 Twined with "Keats at the Globe" bar, the Glode is light and airy and gets excellent sun on winter days. It has a good size bar area and plenty of stools around the windows for resting up and watching the crowds pass by. Service can vary but on the whole not too bad, the range of beers is pretty standard as indeed is the whole pub. The Keats bar on the other had offers a lot in the name but nothing in the pub. The Keats bar is long and passes to the other side of the building where there is another entrance (see 'More Pictures'). The Keats is gloomy and usually full of old City farts, the kind of place where you could really be miserable in and nobody would care.